Internal waves are a common phenomenon associated with stratification developed in summer-time shallow tidal seas. From a hydrographic point of view, they result in very rapid undulations in the main velocline which, if not accounted for, will result in significant refraction errors in multibeam data. Mechanical sound speed profiling, both static and mobile, cannot sample this structure adequately. Thus an alternate means of detecting and accounting for that variability is needed. 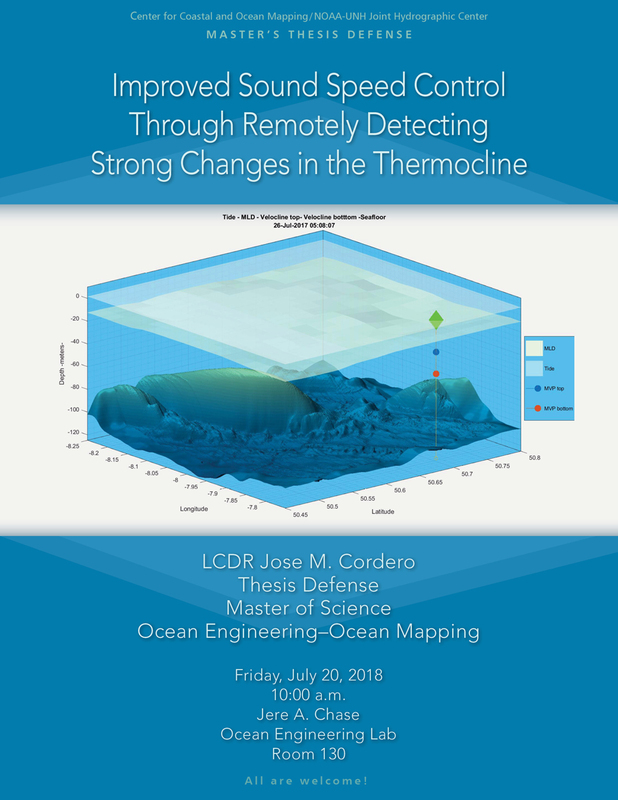 Within the oceanographic community, it has long been recognized that a distinct volume scattering layer is often associated within or close to major oceanographic boundaries. This has been noted to reflect a combination of temperature/salinity microstructure or zooplankton around the pycnocline depth. Several weeks of multibeam survey on the Irish continental shelf were undertaken during which multispectral acoustic scattering data from a scientific Simrad EK60 echo sounder was acquired together with a Moving Velocity Profiler. This thesis proposes and implements a method to determine the evolving sound speed structure by processing the images of the EK60 echosounder. This is done by extracting the scattering layer depth and finding the correlations with the velocline found in each of the discrete MVP profiles. Then, by calculating the associated depth bias in the seafloor modeling caused by the difference in sound speed structure at each ping, a visual indication of the need for a new in situ measurement is made. In this manner, if successful, the sound speed structure could be monitored and the spatial and temporal resolutions of the profile casts could be adjusted more efficiently. LCDR Jose M. Cordero graduated from the Spanish Naval Academy in 2001, completing his OHI CAT-A degree in the Spanish Hydrographic Institute in 2006. Since then, he has been sailing aboard different hydrographic and oceanographic ships, surveying blue and shallow waters. He has been deployed for long periods in Antarctica and the Horn of Africa and he also completed the circumnavigation scientific expedition “Malaspina 2010” aboard the research vessel Hesperides to gauge the impact of global change on the ocean. He is, as well, a maritime geospatial intelligence analyst.